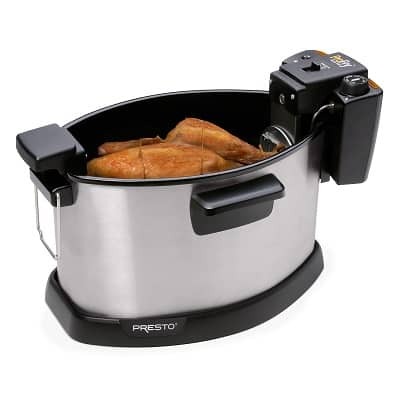 The Presto ProFry electric rotisserie turkey fryer makes deep frying a turkey simple and hassle-free. 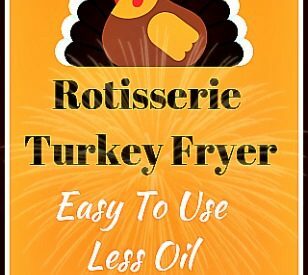 The fried turkey done rotisserie style needs less oil (uses only about 4 quarts) compared to the traditional deep frying method using a big pot of 3 – 6 gallon oil. This multi use deep fryer can be used to deep fry chicken, French fries, seafood and lots more. You can also use it for boiling and steaming food. When it doesn’t take too much trouble to deep fry your turkey, then you’ll enjoy doing it. Who can resist delicious fried turkey that is tender and moist? Not to mention the heavenly aroma! In fact you’ll find yourself using the Presto ProFry electric rotisserie turkey fryer often during off peak turkey season. After all, fried chicken tastes great too. Presto Electric Rotisserie Turkey Fryer – How does It Work? 1 Presto Electric Rotisserie Turkey Fryer – How does It Work? This indoor electric turkey fryer features a motorized rotisserie feature that continually rotates the turkey in and out of the oil during the cooking process. It is controlled using the on/off switch. You’ll be pleased to know that it uses only one-third the oil of traditional electric turkey fryers and one-sixth the oil of many outdoor fryers. You’ll need only 4 quarts (about 1 gallon) of oil compared to the 3 gallons for an outdoor 30 qt turkey fryer pot. It fits in a 15 lb whole turkey (frozen tag weight). For a fresh whole turkey, the maximum weight is 12.5 pounds. Estimate about 4 minutes per pound. Make sure frozen turkey is completely defrosted before deep frying. The instruction booklet comes with instructions on how to defrost your turkey before use. Besides deep frying rotisserie style, you can also deep fry French fries, onion rings, nuggets, fish etc using the fry basket that comes with the package. Boiling or steaming vegetables or seafood works great too. Always insert the control assembly in the removable pot before plugging the unit into the wall outlet. The rotisserie has to be used whenever you’re cooking a whole turkey. The whole chicken can be fried using the basket. Make sure the rotisserie is properly assemble when using it. 3 parts have to be assembled – the pivot handle assembly, the lifting handle assembly and the skewer. The skewer has to be assembled to the pivot plate located on the handle assembly. Do check out the video below on how it is done. Apply cooking oil to the chain side of the pivot plate to lubricate it. Make sure the turkey is centered on the skewer for the rotisserie to rotate properly. To make sure that the skewer is locked in place, pull firmly on the lifting handle. Lifting handle hooks must be placed over the fryer rim to ensure that the rotisserie will fully rotate. The fryer is equipped with a sensor which will automatically shut the unit off if it is overheated. There is a reset button at the back of the control panel. You’ll need to press this reset button to get the fryer to start working again. When oil is heating up, the Ready light will be on. Ready indicator light will go out once desired temperature is reached (375 degrees F). It takes about 20 minutes to heat up the oil. Make sure the frying hooks are placed over the fryer rim. Otherwise the rotisserie will not fully rotate. Cleaning up is simple as the heating element and enameled pot can be removed for cleaning. Always make sure the unit has completely cooled down before removing the parts to clean. 14.81″ W x 14″ H. It has depth of 21.37″. 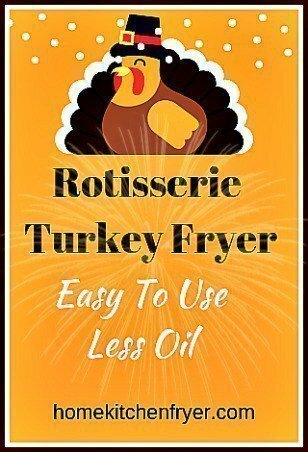 Rotisserie turkey fryer uses 4 quarts oil compared to the 3 gallons needed for a 30 quart fryer pot. Deep frying a turkey takes a slightly longer time in the rotisserie fryer – about 4 mins per pound compared to the 3 – 3.5 mins per pound using the traditional method. A 10 pound turkey will take about 30 minutes in the traditional pot compared to 40 minutes in the rotisserie fryer. The electric fryer can be used indoors on your kitchen countertop but not the propane turkey fryer pot which must be used outdoors. It doesn’t come with a drain spigot for easy oil removal. You need to remove the pot holding the oil after the oil has cooled down. Use fryer on a stable surface. Make sure there is sufficient amount of oil or water. There is the danger of overheating if oil/water is insufficient. Fryer will then shut down and you’ll need to reset it again. Peanut oil is highly recommended because of its high smoke point. Do not use solid fat (shortening, butter, margarine, lard) as these do not melt uniformly. This can cause the unit to overheat and shut down. Then you’ll need to reset it again. Make sure pot and parts are completely dry before pouring in the oil. Oil and water mixing together can be dangerous. Water droplets in the hot oil will cause the oil to splatter and boil over. Make sure turkey is centered on the rotisserie so that it will fully rotate. Do not cook the turkey with the cover on. When using the frying basket, fill up to 2/3 full. If cooking French fries, then only fill up to 1/2 full. This is to ensure that the food will get crisp. Make sure food is of equal size and thickness to ensure even cooking. To prevent coated or breaded food from sticking to the basket, lower the empty basket into the hot oil before putting in the breaded food. You can also fry the battered food without using the basket. When frying high moisture food, do not use the cover. For crispier food, fry without the cover. Make sure to fully drain the oil out of the turkey or chicken cavity after frying to minimize burns and scalds. To drain the oil from the cavity of the fried chicken, lift up the frying basket to the drain position. Rest the drain hooks on the rim of the removable pot. Push down on the basket handle to tilt the front end of the basket up.